Comic-Con: Universal Destroys San Diego Convention Center for ‘Oblivion’ | Radical Studios, Inc.Radical Studios, Inc.
Universal Pictures has a bleak view of the future of Comic-Con. 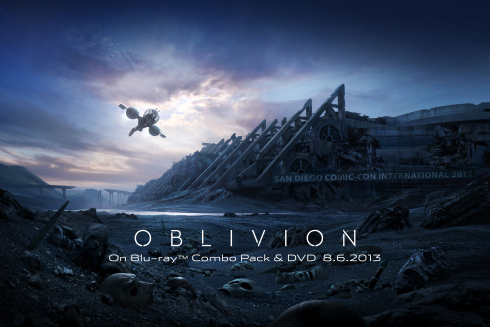 The studio released an image of the San Diego Convention Center in ruins on Monday to promote the upcoming home video release of “Oblivion,” starring Tom Cruise, out Aug. 6. The post-apocalyptic scene of downtown San Diego is meant to show what the city would look like in 2017 — at least in the film. Andree Wallin, the concept illustrator for “Oblivion,” created the image that was commissioned for this year’s fanfest, that officially kicks off Thursday and runs through Sunday. Universal will make the image available as limited edition tote bags at Geek magazine’s booth on the convention center’s show floor. Based on Joseph Kosinski’s graphic novel, “Oblivion” will be released digitally on July 23, before bowing as a Blu-ray combo pack and on On Demand on Aug. 6.